The following comments about attractions in Ankara have been posted from individuals. We believe that the best reviews of Ankara, Turkey are written by travellers and holiday makers who have experienced Ankara first hand and want to share their thoughts. Can you share yours? 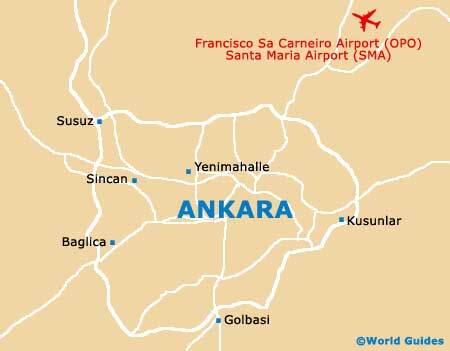 Please help us expand this section of our Ankara World Guide. Let us know what you think about the attractions in Ankara, Turkey. Submit comments about Ankara attractions here. Never seen so many artefacts under one roof! After the enjoyment had at the Ataturk Mausoleum, I wanted to go further into history and managed to do just that at Anatolian Civilisations Museum. I was told that there are 200,000 pieces here and even though just a fraction of them were on display, there were far more than I've ever seen elsewhere. We wished to know more about the history of this fantastic country that seems halfway between the east and west and it was done at Ataturk Mausoleum - named after the man who bravely founded Turkey as a republic almost 70 years ago. As well as great statues and monuments, you are able to enjoy performances here. I'm curious for knowing where you travelled to from the capital or were you travelling into Ankara from another in Turkey? Have to agree about carriages - they were luxury standard but to travel on them was very cheap and we had a lot of money left for other trips around Turkey. A safer option than the Midnight Express! Although flying to other Turkish cities takes far less, we thought the best way to enjoy the country's landscape would be by travelling in style on the Ankara Express - The Turkish State Railway. We were waited on hand and foot and each carriage was in an immaculate condition. 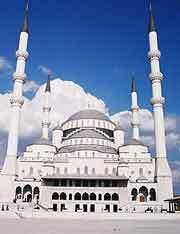 I am fascinated by the architecture of Turkey and its mosques. The Kocatepte Mosque definitely lived up to its billing and you can see why it took 20 years to build. A place of interest for both Muslims and non-Muslims alike while being easily accessible in the heart of the capital's centre.